Healthy breakfast. After a binge weekend and a flare-up of depression I am reminded that all my binge food was awesome. I am awesome. Today I will work, gym, and sweat. 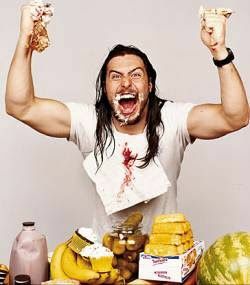 I want Andrew WK's biceps. I know he got them through partying hard at the gym, so I just gotta follow auit.